Paperback, 192 pages, 198 x 124mm format. 44 b/w photos. Fascinating insight to the background and operational activity of an honest and humble RAF pilot and leader. Some references to others may seem confronting by today’s standards however the context and appreciation this account was written at the time of the battle and not a post war recollection must be remembered. A fascinating read, this paperback provides, as the title suggests, the experiences of a pilot in this era of aerial warfare. It would be fair to say that over the years, many accounts have been recalled and written with a certain, shall we say... flair. Brian Lane’s account written during the conflict is a poignant, honest and clear account of a young man, tracing his career from his civilian working background in 1935 through his training and subsequent military service. The book tells the story of a man, a pilot, a leader and a gentleman. This is a book with a multi-dimensional appeal with a rare balance of detail and historical significance blended with just the right amount of humanity to appeal to a broad audience. 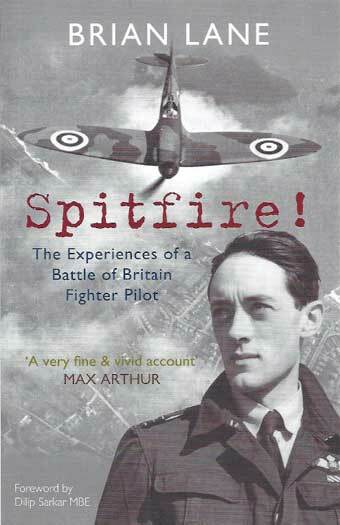 Lost over the North Sea in early 1943, Brian Lane had completed his book however on that day, not only did the RAF lose a fine fighter pilot, we lost the source of further fine accounts of the experiences of a World War II fighter pilot. It must be noted, the text has not been edited for political correctness therefore references made in the book may be confronting to some. It must be remembered the account was written during the conflict and in context with the time was not considered offensive. A comprehensive and detailed foreword by Dilip Sarkar MBE sets the scene for this book and is a must read before embarking through the pages of Brian Lane’s account. Dilip has meticulously researched the text filling in the gaps created by the censors of the day via a listing of the codes and their meanings. Additionally, Dilip has supplied 44 black and white photos to assist in the telling of this insightful account. Most readers will get through the book in short time and like me I’m sure will be disappointed it’s over, I suppose that’s possibly the highest compliment a reader can pay an author and in this case, that compliment is well deserved. Highly recommended to modellers, historians and lovers of a good read regardless of the subject matter. Many thanks to Amberley Publishing for the review copy. Please visit our site at www.warbirdsamg.com where you can download the first two editions of AERO-TORQUE, the third edition is due late September. Issue 002 has a feature on our very own Brett Green in the Modeller’s Profile Section, Issue 003 will feature a brief history on HyperScale and get’s the inside word on the running of HyperScale. As stated previously, Brian Lane was the inaugural pilot featured in the Warbirds journal, AERO-TORQUE, in the regular article, 5 Or More, An Aces Profile. Warbirds Aviation Modelling Group is a Melbourne based military aviation modelling group, meeting monthly, that caters to all eras, all nations and all conflicts in which aircraft of all shapes and sizes have participated.